We’ve been working with matching individuals and footwear since 1975. There have been so many types of shoes, different individual foot types, walking/running styles and body structures. On top of all of that has been an evolution of how to recognize the above and matching them to a functional footwear product. In the beginning, we were happy to have any choices for our customers. Moving forward we soon discovered that we were suggesting footwear choices based on walking/running mechanics, foot shape, and activity use. We then became familiar with terms such as pronation and supination. We experimented with Treadmills and video cameras. This put us to the task of being more than retailers and into the world of biomechanics and building strong relationships with the medical, physical therapy, podiatry, and sports trainer communities. So, how do we buy a running shoe? With so many options in purchasing any product. Athletic footwear may require some guidance, because the correct product can make a large difference. Here at Super Jock ‘n Jill, we would love to see you bring your current fitness shoe. If that’s not available, we’ll have shoes here to help us evaluate you. We’ll ask you to walk away from us and back, if you run or are more active, we’ll have you run away and back. We’ll be looking for things that make you unique and help us narrow the selection of product that would best benefit you. As you take a seat, we’ll ask what current and past physical issues you may have that would relate to your activities. We’d also need to know if you have any request from a medical reference. We’ll look at your foot type and shape. At this point, you should know that the person helping you has gone through an extensive training program to evaluate you, the way you move and the products that would best suited to you. You’ll now begin trying shoes on. Many times, we’ll have you comparing one style of shoe to a totally different style. This is done so that you can quickly identify which shoes have a more desirable fit and feel. We know that each person is so unique and that even your right feet and left can be different. For the best results, we’d like you to go outside and try the shoes on the concrete surface with a bit of an incline. This would give you the best opportunity to stress the shoes on a real surface. By doing this, most of us will find one shoe that feels and functions the best. This then becomes an experience of buying and selecting a shoe, rather than someone selling you a shoe. This our biggest goal: Helping you to Buy a footwear product through Fit, Feel and Function and not bells and whistles. 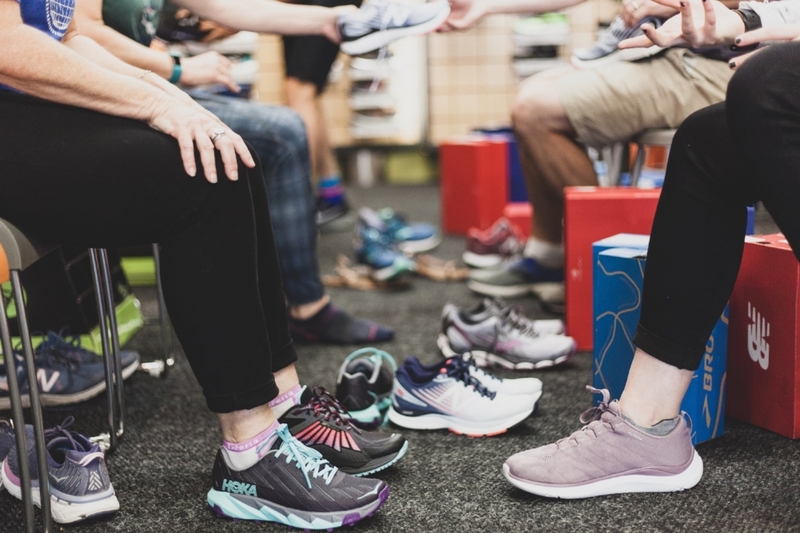 For more information on buying the right running shoe for you, contact Super Jock ‘n Jill at 425-658-4929 or at 206-522-7711 and at info@superjocknjill.com.